It is part of the Pheasant family of birds. It is larger than the other common partridge seen in the UK - the Grey Partridge. 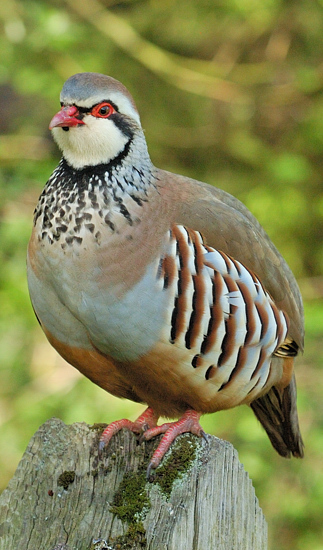 It was introduced into the UK in the 1600's by King Charles II as a game bird species from Europe where is is largely found in France and Spain. They are now resident in the UK and out number our native Grey Partridge. A rotund a bird with a brown back, grey breast and buff belly with large streaked flank stripes. Its short tail has chestnut sides. It has a large white/cream chin and throat patch with a black border, pink legs, and a red bill and eye ring. Males and Females are a like. Juveniles are similar to a young Grey Partridge. The male bird as a loud rhythmic chuffing call. Habitat: Farmland and open stony areas. Food: Seeds of grasses, cereals and weeds, leaves and roots, but young will take insects as an essential protein. Breeding: Around 170,000 breeding pairs in UK. Breeding starts late April a clutch of 10-16 eggs, incubation is 23-25 days, they are led away from the next within days and the brood stay together until the next breeding season. Distribution: They are numerous in England especially in the east, with some on the Welsh borders and in eastern Scotland. Usually found in open fields in large groups. 136,000 territories they have been recorded in. Behaviour: When disturbed it prefers to run rather than fly, but can fly a short distance if necessary. They form flocks outside the breeding season. They breed on dry lowlands, such as farmland and open stony areas usually among bushes or hedgerows laying eggs into a ground nest lined with plant material. They are unusual in that the female will usually make 2 nests and lay a clutch in each and then the male and female take care of each brood simultaneously and independently. British birds are sedentary, only moving a few kilometres from where they were born. Conservation Status: As they are breed for game shooting and numbers are large, there is no conservation status necessary.